I had many green tomatoes left over after the gardening season. I just hated not saving them for future use. I had read that you can store green tomatoes for future use by wrapping them individually in newspaper. So I gathered all my green tomatoes in October and wrapped them separately in pieces of newspaper. I then put them loosely in a brown paper bag and put them in my basement larder. Today I carefully unwrapped a few of the newspapers to check on the tomatoes. I needed a few tomatoes for a green salad I wanted to make. I was pleasantly surprised that many of the tomatoes were bright red and ripe. A few were still green or orange so I just re-wrapped them and put them back in the bag to use later. So if you have green tomatoes, you might want to try out this useful idea for storing and ripening your tomatoes. 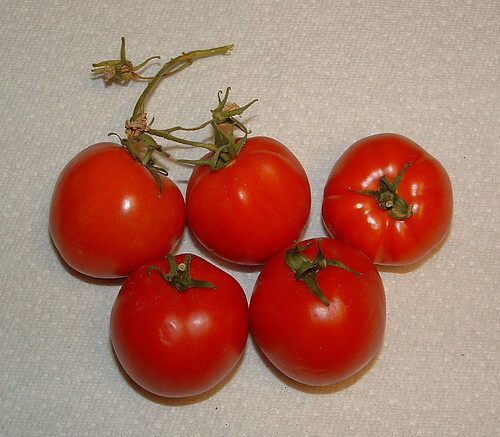 Using this method will provide you ripe tasty tomatoes well into the winter months.